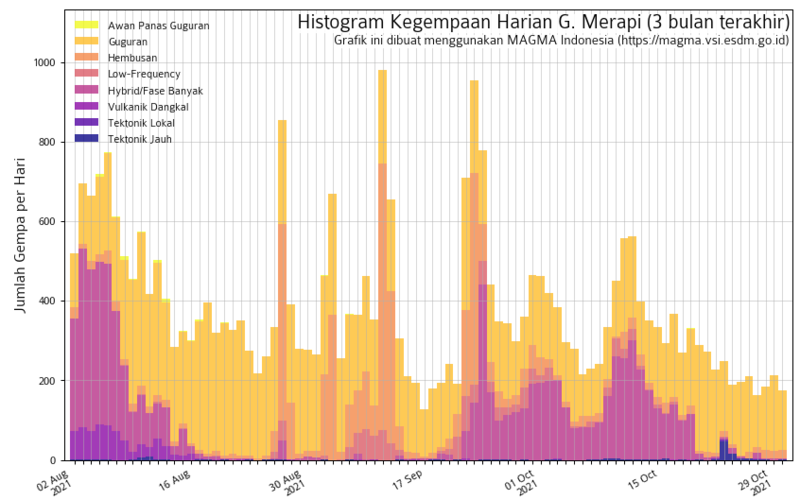 Well, officially the eruption seems to have ended on 26 October 2017, as listed by the GVP. 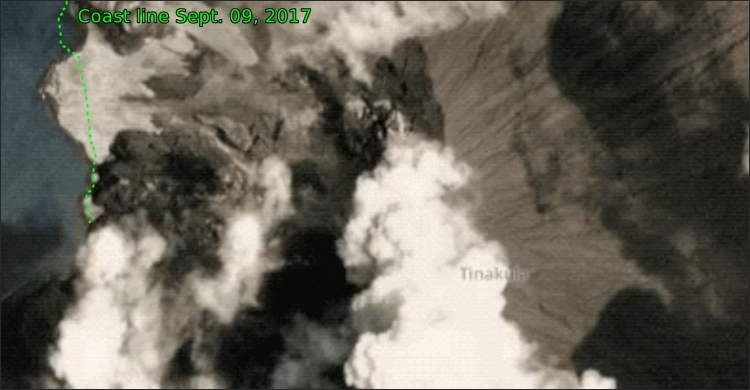 However, National Situation Reports by the NDMO appeared up into the first week of November; a volcanic assessment on Tinakula on Nov. 5 showed numerous eruptions and tremors. Also, news papers reported further ash fall on neighboring islands. After that, it became quiet about the volcano. On occasional traveller photos a steam plume could be seen, in satellite images the island was mostly wrapped in clouds. Towards the end of 2018 I noticed in a satellite infrared image a single “red dot” on the summit of Tinakula, which might have been a temperature anomaly just from very hot gases escaping at a vent. Even so, I kept an eye on the volcano. There were no other news, no official announcements, reports or photos. Just more thermal anomalies during December and January, up to yesterday. However, the reason for doing an update now is not a change in volcanic activity: We were kindly allowed by Captain and crew of the Research Vessel “Petrel”, who are presently working in the area, to show a few of their fine photos of Tinakula! Just to see how the volcano is doing now. 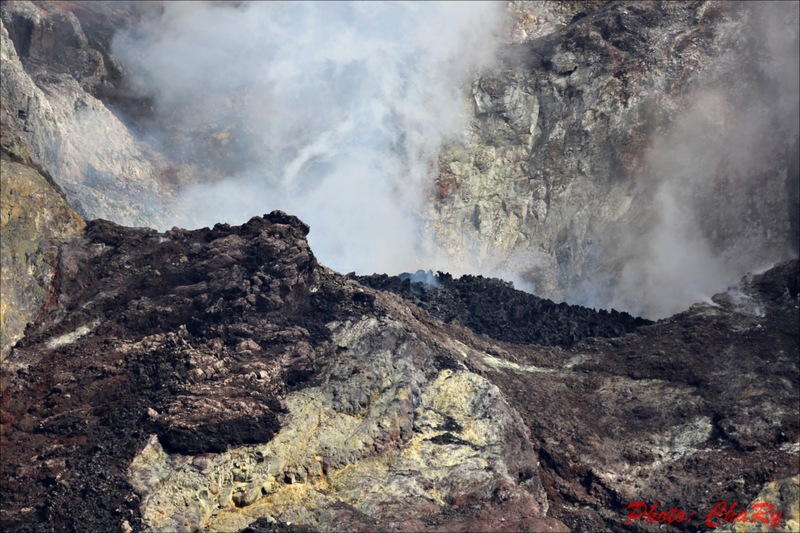 Of course these photos had been provided to the local authorities beforehand so that volcanologists may assess visible changes in the volcano (there are great shots zoomed in on the crater among them!). 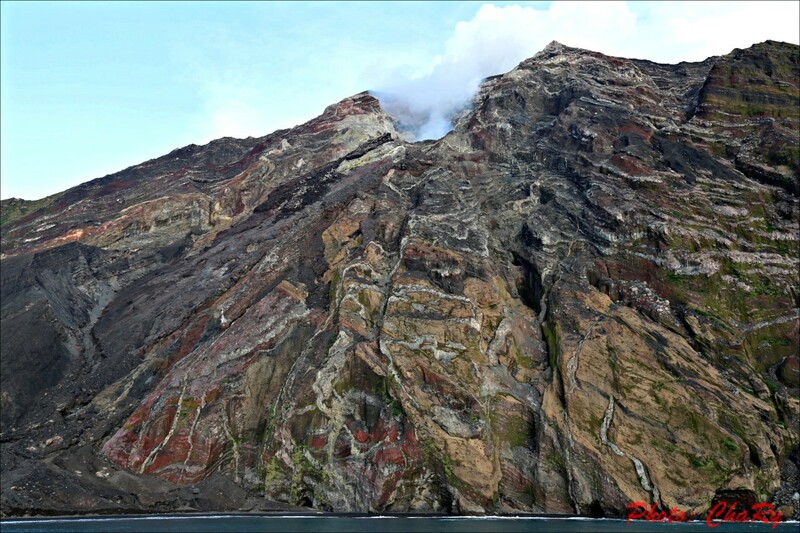 The ship’s crew also report that the volcano is gently steaming away and presenting a nice orange glow at night. Many thanks! (© Ryszard Chajęcki, R/V Petrel) All following photos are Courtesy of the Captain & Crew of Research Vessel Petrel and are used with permission. Looking back through the satellite images available in the viewers*, one can assume that Tinakula’s activity increased slightly since early December 2018. Sentinel-2 images show heat anomalies on 08/12/2018, 02/01/2019, 12/01/2019 and 27/01/2019. Suomi NPP/VIIRS imagery (captures hot spots within 300m squares) shows red dots on the summit on 01-03, 08-09/12/2018 and 13, 18, 20, 30/01/2019. Thermal anomaly in Tinakula’s crater seen by Sentinel-2A L1C images (rendered in false color mode based on bands 12,11,4). Left: 02/01/2018 and right: 27/01/2019. Even though satellite images clearly show incandescence, there are almost no records on MIROVA Radiative Power graphs. This could be due to persistent cloud cover, or, that the heat source is just not strong enough. Lava Dome or Cinder Cone? 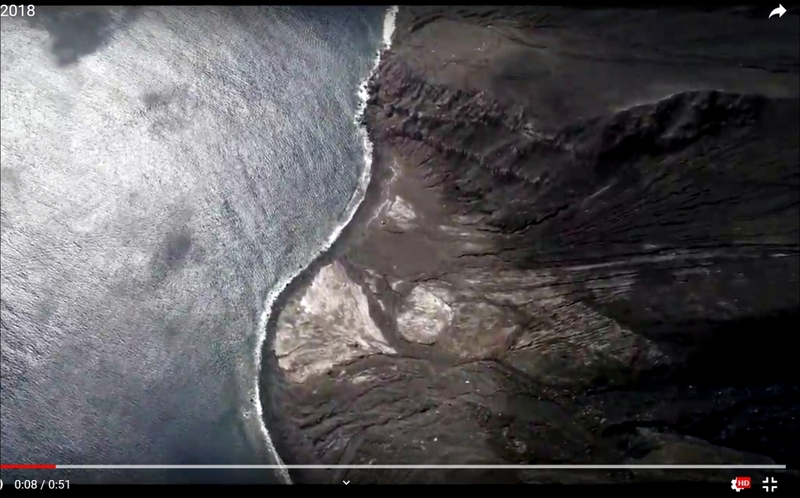 Among Ryszard Chajęcki’s photos taken from the R/V Petrel is this remarkable zoom on the crater: a heap of fresh black lava cinders can be seen rising within. It could be another cinder cone, such as there have been before. Or is it a lava dome? I really look forward to any official statements. 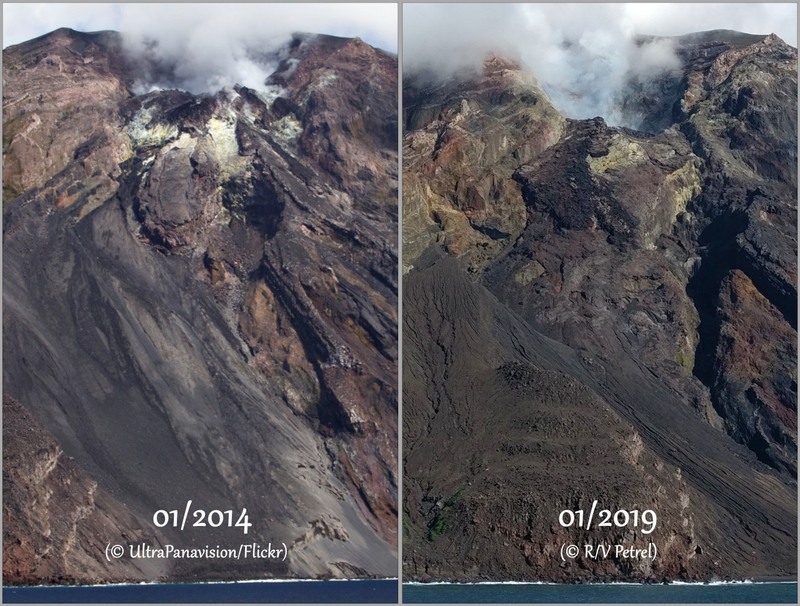 Comparison of Tinakula’s breached NW side in images from 04/01/2014 and 25/01/2019. Changes in size and shape of the crater can be seen as well as new deep cracks in the apron of lava flows and volcaniclastic debris below it. 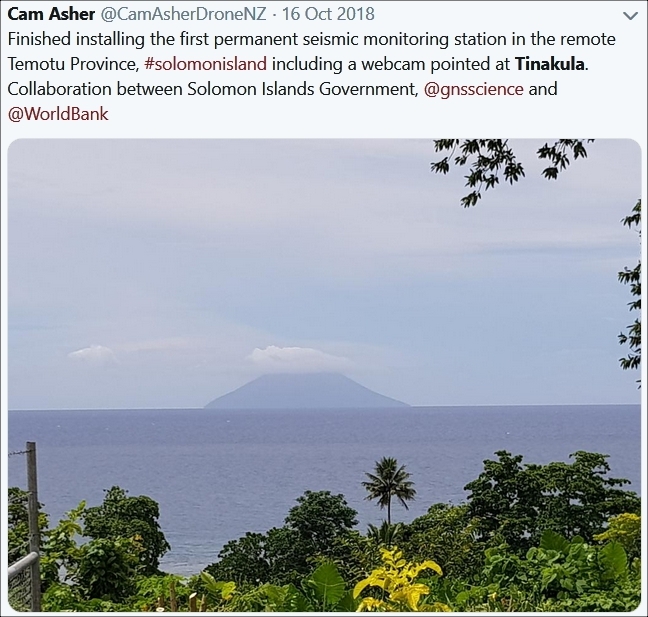 In October 2018 GNS NZ Science reported that a project had been started on the Solomon Islands to better keep an eye on volcanic and seismic hazards. The World-Bank-funded project involves installing new permanent seismic monitoring equipment in six of the nine provinces, helping to set up a monitoring centre in the capital Honiara, and providing training on maintaining and operating the new gear. 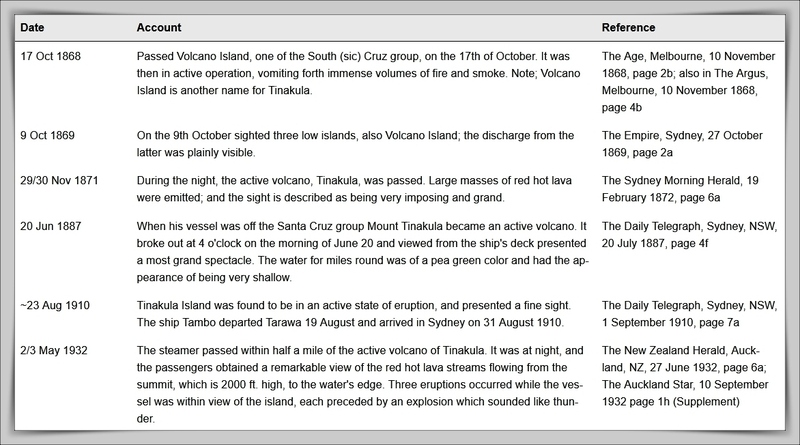 Newly discovered historical newspaper accounts of volcanic activity from ships passing near Tinakula between 1868 and 1932. Courtesy of Steve Hutcheon. (GVP Bulletin Report: 02/2018 [BGVN 43:02]) Click to enlarge. So, for now all seems to be fine with Tinakula. Except that its eruptive history shows us that, generally, this volcano is a very busy beast – every few years it has been up to new mischief. So, probably it won’t be long before we hear from it again. Hopefully, it will not affect the neighboring islands’ people so as to stop them playing their lovely music. Many thanks again to the crew of R/V Petrel and their captain Mr. Allan – may you have a safe and successful journey and always six inches of water under the keel! Mam oryginałytych zdjęć. Wyrazie zainteresowania proszęo kontakt na priv. 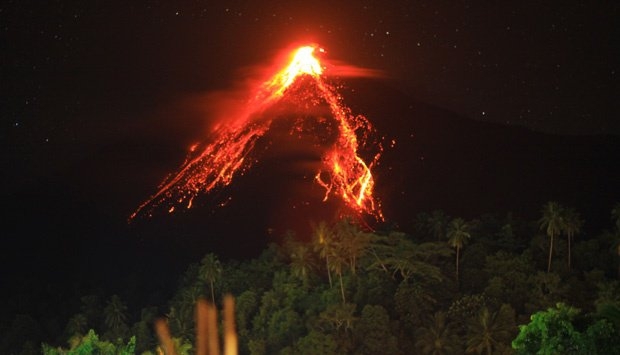 Things are getting unpleasant at Karangetang volcano (Indonesia). 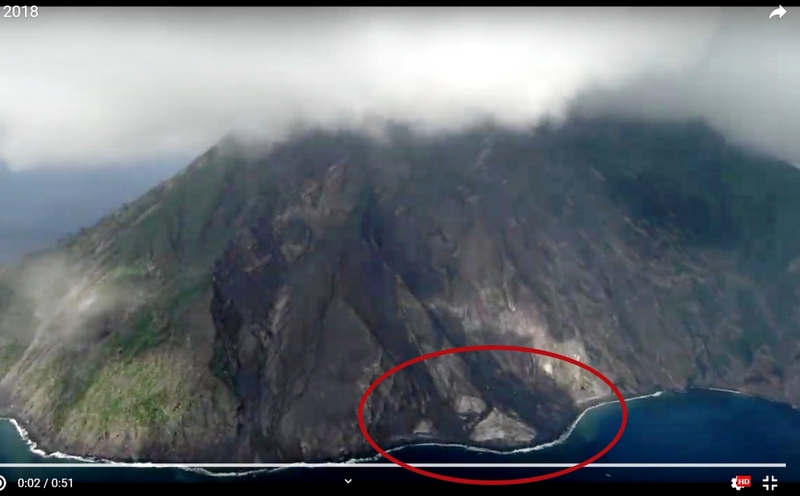 Lava flows from the northern crater have cut the only road, which leads around the northern part of the island near the coast, and have reached the sea. Some villages had to be evacuated. Alert level 3.